Horham Hall, a member of the Historic Houses Association, together with its 4 acres of gardens is open to the public by arrangement. Court records recall that Queen Elizabeth I visited Horham Hall with her court in 1571 for 9 days and 1578 for 6 days. During her stay she went hunting in Henham woods. 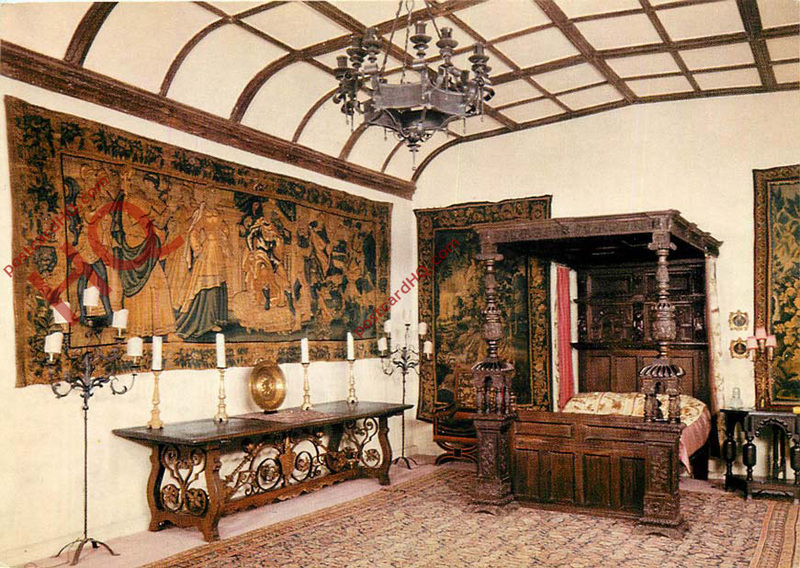 Her bedroom is on view. 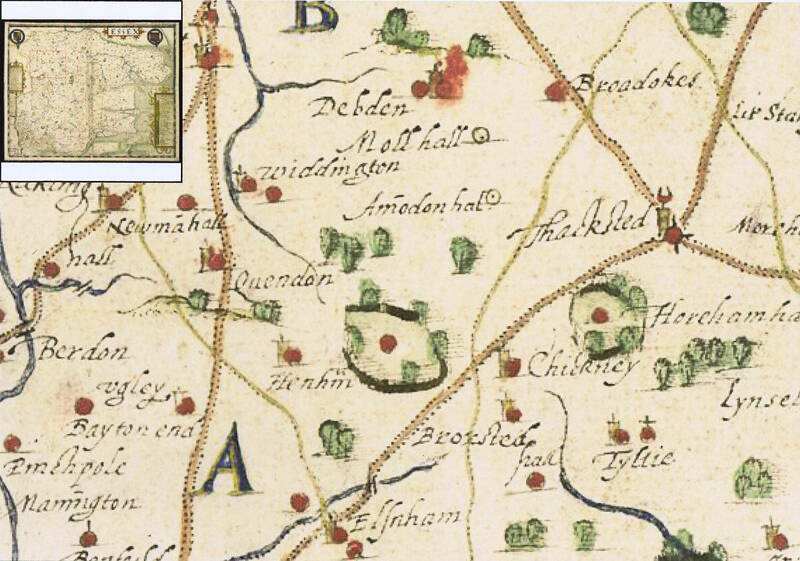 As Queen Elizabeth I rode across the fields and woods to this village whilst hunting, it should be of interest to Henham children as part of their Elizabethan school project work. To make a visit click - here. 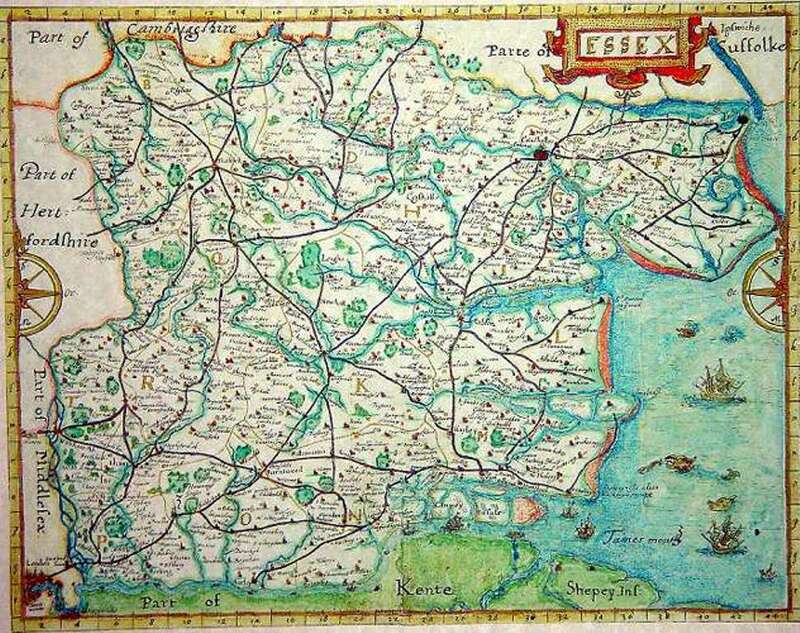 John Norden's 1594 map of Essex. 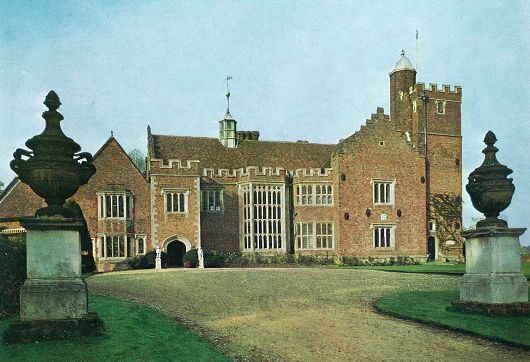 Horham Hall is immediately to the right of Henham. 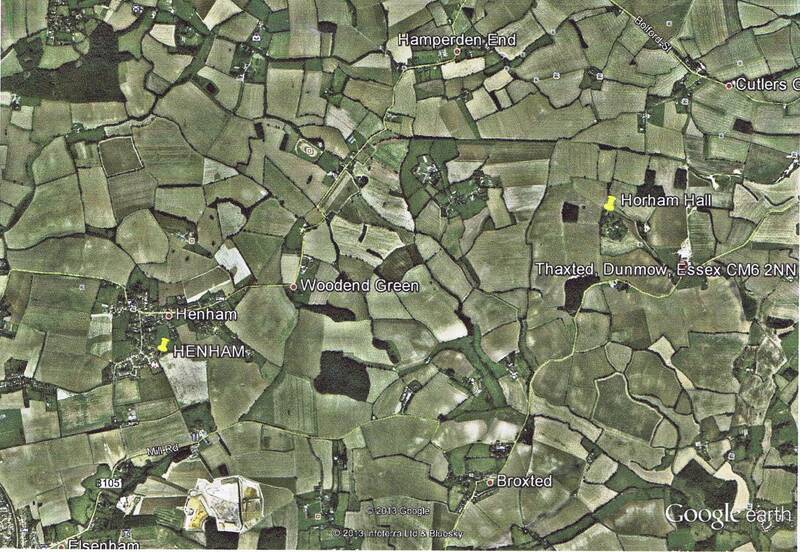 It has some positional inaccuracies but the road from Thaxted to Elsenham would seem to be the present B1051. The brown road that runs north through Thaxted is the current B 184. North of Thaxted, but before Howlett End, is a yellow minor road on the nearside of the B 184 which now goes westward to Yardley Hall. That yellow road runs southwest to cross the B 184 just south of Broadoaks ('Broadokes' on the Norden map) and continues southwest, passing very close to Horham Hall, crossing the Elsenham - Thaxted road (B 105) west of Broxted and passing through Molehill Green until it forks under the present Stansted Airport to go west to Bishop's Stortford or east to Takeley. That yellow road doesn't exist today other than in a few fragmented sections. Even allowing for the inaccuracies, the roads used by Elizabeth were sometimes quite different to those we know so well today. Henham Park (Essex), iv. 87.